Are you ready for the wildest teambuilding program yet? 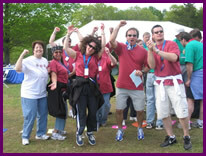 The Ultimate Game is pure fun and an incredible energizing event. Imagine a giant, colorful game board, large enough to accommodate your entire group. The music starts, the extra-large dice are rolled, and the game begins! Teams work their way around the game board, furiously trying to answer trivia questions and complete wild and wacky "team challenges". Teams earn points for team spirit, creativity, and enthusiasm! If you're interested in seeing your group soaring to new heights of fun, frantic energy this is your chance. The Ultimate Game is a perfect choice to kick off an off-site, celebrate a success, energize a day of meetings, or as a send-off to dinner after meetings. The Ultimate Game is completely customizable. We can work with you to incorporate company trivia, or let us provide it for you. What Game do you want to be in? We'll customize any topic you pick. There is no debrief for this event. Ending can incorporate an awards ceremony or recognition event if desired. 30-400 participants, the more the merrier! Team sizes can vary from 5 to 12 participants per team based on your group needs. 45-90 minutes. Can be incorporated as a grand finale to a half-day or full day of teambuilding. An open space with no tables or chairs. The larger the better, but the giant game board easily adapts to accommodate whatever space you have available. The Ultimate Game works well in either an indoor or outdoor setting.